CHAUVET DJ’s EZLink Strip Q6 BT takes wireless LED lighting to the next level. Harnessing the power of Bluetooth technology, the EZLink Strip Q6 BT is convenient and simple to use. Dynamic LED lighting is easier than ever thanks to CHAUVET DJ’s BTAir app. It allows you to control the EZLink Strip Q6 BT wash light wirelessly using a smartphone or tablet. No extra hardware is needed. This powerful and versatile LED wash light is great for mobile applications. With an onboard rechargeable battery, the EZLink Strip Q6 BT delivers true wireless performance. You’ll enjoy total wireless freedom and cut your setup and teardown times. Six RGBA LEDs power the CHAUVET DJ EZLink Strip Q6 BT wash light. Rated at 3W each, these LEDs crank out intense colors, including true amber output. You’ll enjoy natural-looking color temperatures and rich, vibrant and warm color-mixing. 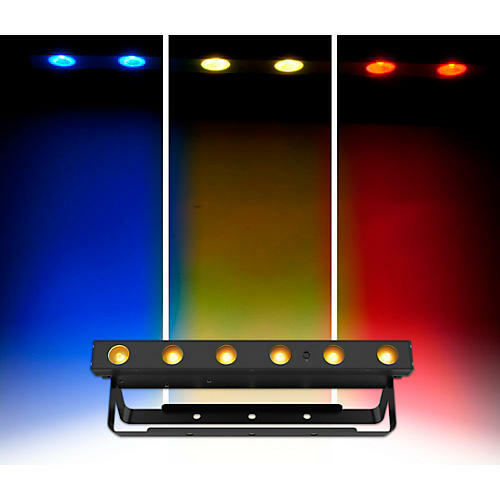 Harness the power of the EZLink Strip Q6 BT LED fixture using DMX control. Use the light straight from the box with standalone and built-in auto modes, including sound active. But if it’s simplicity and versatility you want, it’s hard to beat the ease of wireless Bluetooth control using the BTAir app. Either way this fixture makes the perfect addition to any lighting kit, whether you’re a mobile DJ, live musician or other performer. LED lighting made simple—order today.